Is your writing standing in the way of your blog’s success? 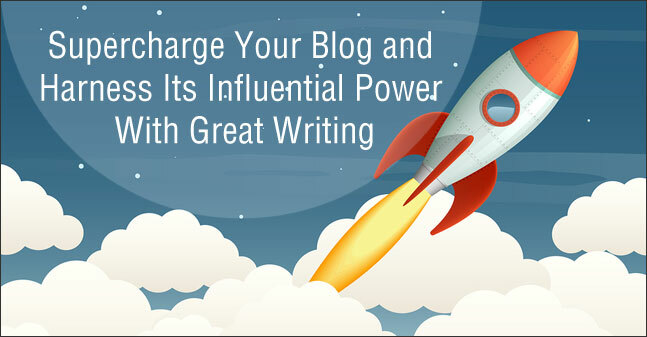 Would you like to take advantage of the power that your blog holds? The amazing thing about a blog is that it holds one of the greatest influences when it comes to consumers making purchases. Could the reason why our blogs aren’t more successful simply be our writing? In an article published by Social Media Examiner, the author quotes a study done by Technorati entitled the 2013 Digital Influence Report. That report put blogging as the 3rd most influential digital resource when making overall purchases. People are looking for a trusted source. 61% of consumers made a purchase based on a blog post. 70% learned about a company through its blog. Your blog holds the power to influence purchases. What you say has value and people are looking to read it, right now. With all this opportunity out there with our blogs, the one thing we cannot do is showcase poor writing. I’m sure there are a lot of reasons why people say blogs are not successful. One of the biggest reasons, and the one we are focusing on for this week, is that blogs fail because the writing is so bad. You know what I’m talking about, don’t you? The typos, spelling errors, and the sentences are either too hard to understand or simply do not make sense. When you yourself are looking on the Internet and you come across a blog with poor writing, instead of finishing the article, do you just move on? You can move on because there are millions of blogs out there on the same topic. The Internet is saturated with blogs and peoples’ opinions. Why would you trust someone who cannot put a basic sentence together or does not care enough to double check their work? Well written articles are the foundation of winning our readers’ trust. With that thought in mind, I wanted to provide a list that will help us become better writers, win the trust of our readers, and take advantage of the influential power of our blogs. We have all taken English classes, but we haven’t always paid attention. Who knew the importance writing would have in today’s online marketing world? You started your business to sell a product or service and change the world, not to become the next Ernest Hemingway. You do not need to become an Ernest Hemingway, but we all need to make sure that our blogs are free of typos and full of intriguing sentences. What exactly does writing with an active voice mean? In an article by Copyblogger, they describe how an active voice is structured with an SVO sequence. SVO sequence is Subject, Verb, Object. A passive sequence is Object, Verb, Subject. I know, that’s a lot of English jargon. The subject is passive sentences. The verb is bore or bored. The reality is that you cannot always write in an active voice. The goal is to write using an active voice as often as possible. In a different article written by Copyblogger, Julia Ogden writes that most readers will read around 250 words and then they will start skimming. Knowing that, our opening paragraphs need to bring a punch. Do that by summarizing your article in 35 words or less to grab your readers’ attention. Provide the who, what, where, and when as quickly as possible. Use the rest of the time to break down the why. Choose simple and not complex words. Communicate more effectively by keeping things simple unless the only way to communicate is through more complex wording. Your blog is a great way to influence purchases and people. Make sure that you are allowing that influence to happen by writing good sentences and great blog articles. Are you struggling with proofreading? While it would be wonderful to have someone else proofread all of your articles, sometimes that is just not possible. Learn how to proofread your own articles by reading 10 Tips on How to Proofread Your Blog Articles. Have you been influenced by a blog article? Which tip do you find most helpful? Please share your thoughts with me. I’ve certainly been influenced by THIS blog Christine and yes, somehow, it might have influenced my decision of use R&R Web Design to develop my own website. Passive voice is tiring, I used it in my opening sentence above (just noticed! ), it is a common advice for good blogging to avoid using it unless it’s absolutely necessary. The third point is also popular, but I’m not so sure I know how to keep it ‘active’ and ‘simple’ in one paragraph without repeating the title (which I find redundant) or writing too much. I prefer to use questions to start the article (like you suggested in a previous article). I feel comfortable writing them and I find they’re an easy way to let the reader know where the article is heading. I have been paying extra attention to my opening paragraphs lately. I’ve made sure they are as close to 35 words as possible, somehow sum up my entire article, and get as much of the who, what, where, and when as I can. It isn’t easy. Basically, I write two sentences. The first states the main problem I’m trying to address, the second is an intro to my unique version of the answer. Like you said, I do not want to just repeat my title, so in my second sentence I try to add a little more. I’m still using questions to draw readers in. There are a couple of things I like about doing this. These 35 words create something that is easily sharable and my reader knows exactly what they are getting into as they dive into my article. In the example above, I didn’t add the “where” mainly because I didn’t think it was needed. It is important to make it your own and find what works for you. If that’s asking a couple of questions in the beginning, then awesome. Thank you so much for your detailed reply and for the example. It certainly clarifies the point. You’re the BEST! You are so welcome Veronica!